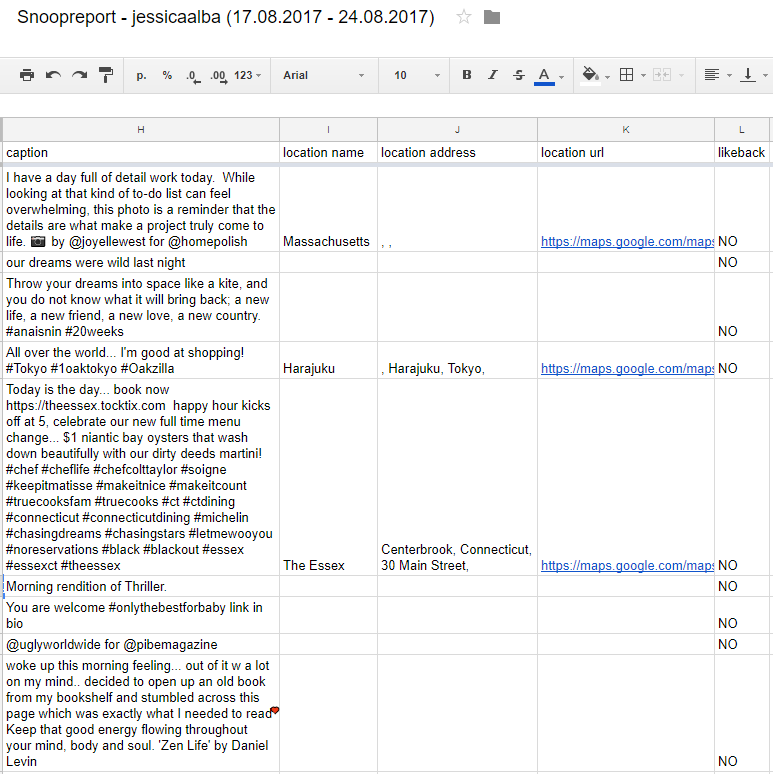 Snoopreport is the Instagram monitoring service that tracks user actions as likes, comments and follows made by users on Instagram. The service has an easy-to-use dashboard where you can add as many Instagram accounts for monitoring as you want. The user activity data is provided in weekly and monthly reports in PDF. To learn more about PDF report, read our article. You can also download the report with all user actions chronographically and additional posts data in CSV for in-depth analytics. 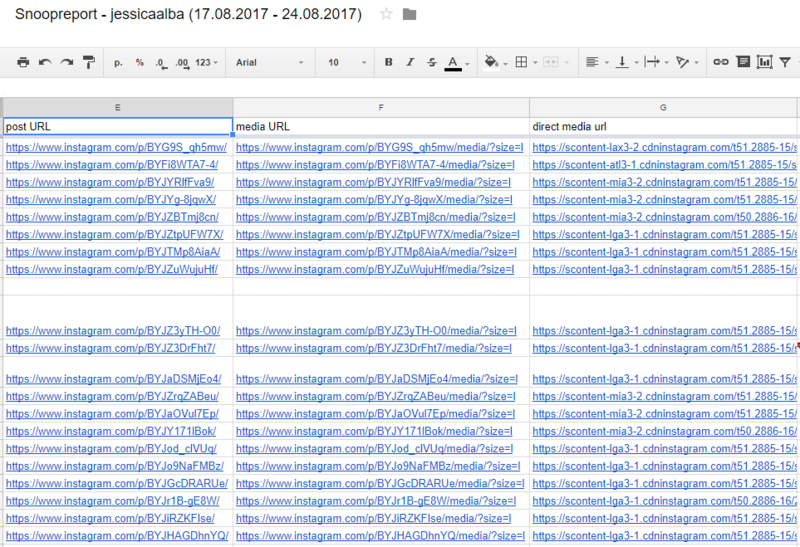 The report contains the information about likes, comments and follows made by a monitored user, plus all possible data about the posts that got likes and comments such as the posts descriptions, posts URLs, geotags and even some metrics. Direct media url – direct link to the media file (photo or video) which can be downloaded directly. This column is useful for image recognition, which can be used, for example, to determine the objects or certain people on the media automatically. Caption – post description that contains text, hashtags and usernames mentioned. This field can be used to define the users or brands tagged in the post. For example, if you want to know what brands the monitored user likes, you can parse this field to get the list of brands automatically. You can analyze captions by using Natural Language Processing for emotional discovery and also to define brands, geo locations and events that are specified as a text. Likeback – the metrics that shows if the user was tagged on the post that he liked. It can be used to distinguish the real user interests from the content where the user is simply mentioned. Primarily CSV reports will be helpful for marketers and analysts. You can learn more about Snoopreport professional use for analytics in our article. The most valuable user insights could be obtained from group reports, in case you monitor several users. You can download the activity data of any number of users added in your dashboard in a single CSV report and analyze the behavior of this group of users. The group report looks the same as the individual user’s one, the only difference is the column Username_Monitored. 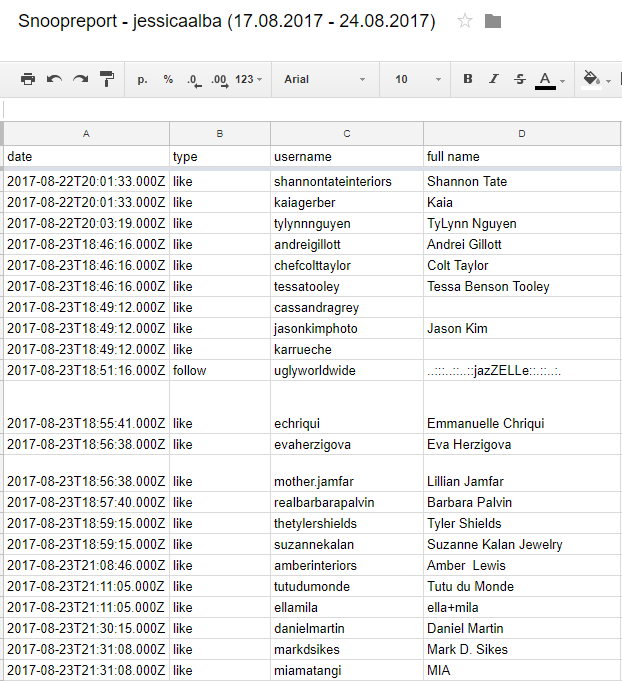 This column contains the Instagram users that performed an action. We will be adding new metrics to our report in the future such as brand, blogger or individual user flag, and much more. We will also add some basic analytics right to your dashboard. Follow the updates!